Momentum and McGregor Coxall win The City Centre’s ‘A Smarter City’ ideas competition. The idea focuses on the adaptability of streets and how they can be used for different functions at different times of the day or week. This was coupled together with interactive technology and public realm to create a street space suitable for the modern city. The predominant component to facilitate this is the use of tiles which can vary in colour to indicate a change of use in a location suitable for varying uses. The proposal includes the use of LED tiles similar to those used by Umbrellium in the design of the Starling Crossing currently being tested in Mitcham. This unique form of surfacing provides an interactive flooring that reacts to people’s movements which can also create different displays chosen and designed by different users and the general public. 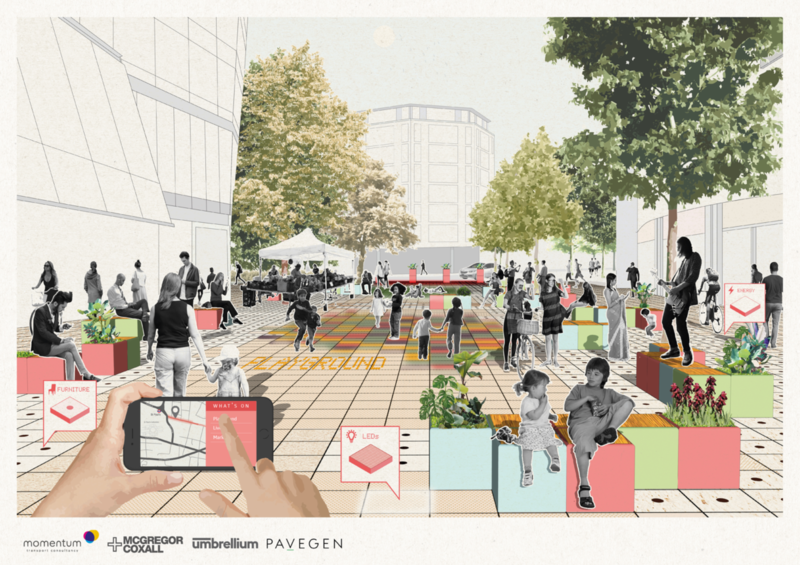 It also proposes to use the energy-creating flooring developed by Pavegen which is currently in use at various locations and can be seen on Bird Street. This seeks to generate energy to power the public space as well as providing another interactive and data gathering tool. The third element relates to modular furniture that can be plugged into these tiles and arranged as required – whether this be in formations or designs submitted by the public, for cultural or leisure uses such as street entertainment or musical and social areas for food and drink to achieve public engagement in and with the space. The concept was predominantly proposed at the eastern end of Cheapside to take advantage of the busy flow of visitors to St Paul’s that could be drawn into an engaging public space at times when the facilitation of peak time traffic is not required, consequently bringing another level of life into the area at different times. This use could also be extended to the ongoing trial at Bank junction to provide a revolutionary public space on Royal Exchange and potentially across Bank junction in its entirety. There is an increasing need to provide for the number of pedestrians on our streets. To retain our status as a world class city London needs to create spaces that incorporate engagement and leisure as well as accommodating the vehicular traffic needs of the City, so that people wish to stay and linger in the space. At Momentum Transport Consultancy we thrive on these challenging environments and seek to provide spaces that work for people through considered analysis, planning and design. For further information, please contact Dave Murphy at Momentum.